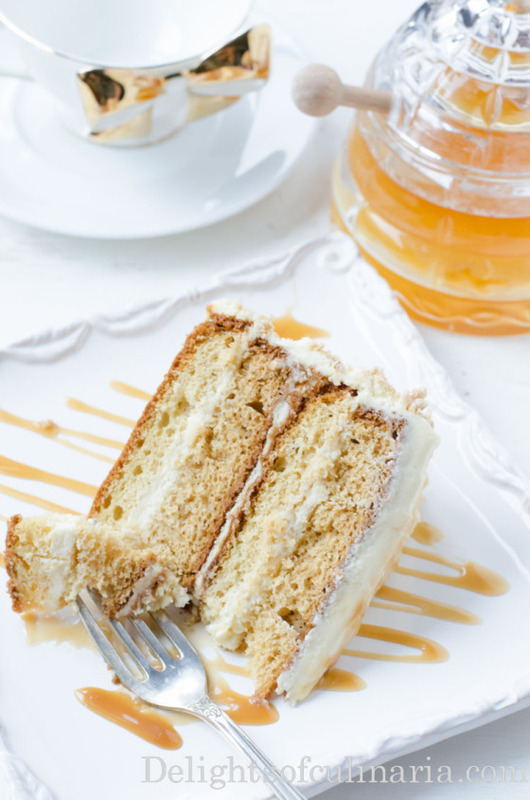 This a 4 layered honey cake with smooth mascarpone cream frosting. 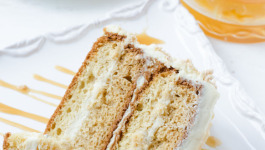 You can add nuts for some crunch and drizzle caramel sauce for a twisted unique flavor. It’s really delicious and impressive! 4 ozs. cream cheese room temp. On high speed beat the eggs until pale and fluffy. Slowly add sugar and beat for another 3-4 minutes. Lower speed to medium-low, add honey. Mix baking soda with vinegar and add to eggs mixture. Gradually add in flour. Go slowly so the batter stays fluffy. Line the bottom with parchment paper and spray two springform baking pans (9” round) with cooking spray. Pour the batter evenly into the baking dishes and bake for about 30-35 minutes. Check if the cake is ready with a toothpick, if nothing sticks to it, it is done. Beat together butter with cream cheese. With mixer still running, slowly and gradually pour in condensed milk. Add mascarpone cream and beat on high until well incorporated but not more than 1 minute. Slice two cakes in half. pour,spray, or drizzle soaking mixture on first layer. Spread some frosting. You can sprinkle with nuts,toffee bites, or add prunes to each layer (optional). Repeat the steps with each layer. Spread the rest of the frosting all over the cake. Decorate the sides and top as desired. I used trader Joes O’s (crushed in a blender) on the sides of the cake and drizzled caramel on top. I used trader Joes O's (crushed in a blender) on the sides of the cake and drizzled caramel on top.